Getting the word out about your business on social media is crucial. The sheer abundance of websites out there means that it is harder for customers to find you, unless you go out and specifically target them. But, there are so many choices for social media platforms, and marketing seriously on all of them can be an intense drain on your resources. How do you determine which platforms are right for your business, your message, and your potential clients? 1. Read up on each platform. See what the experts are saying about what your type of business can gain from each platform. Find out where your customers are hanging out (yes, you need to do some homework) and what their purpose is in participating in each platform. Familiarize yourself with who is utilizing which platform (gender, age, income bracket) and make your determinations on where to focus based on who your potential clients are. 2. Competitor research. Where are your competitors or similar businesses doing their social media marketing? Where are they succeeding and where are they failing? Measure this by taking a look at their engagement – not how many fans or likes, but how many “are talking about this“. If your competitors are seeing engagement on certain platforms but not on others (lots of conversation on Facebook, for example, but no retweets or mentions on Twitter, for example) there is probably a reason for it. But keep in mind that if your competitor has a desultory Facebook page with very few fans, that just means appropriate effort hasn’t been made and does not reflect on the platform. 3. Check out the already existing groups and pages. In order to determine whether the users of a platform are interested in your niche, find out what they are already talking about. If there are many groups dedicated to your topic, it will be easy for you to market to these already existing audiences. If you have to build it all from scratch, you will need to invest more time and may not get the same results. Do a hashtag search on Twitter, for example, or a group search on LinkedIn to find out what conversations already exist surrounding your topic. 4. Determine what type of content you want to share. If you want to share visual content (pictures, infographics, your portfolio, examples of your work) your time may be better spent on networks dedicated to images such as Pinterest, Instagram and Facebook. If your content is mostly blogs or text with links, Twitter and LinkedIn are more conducive to that type of marketing. If you are interested in marketing via videos, consider Youtube and Vimeo. 5. Give lesser-known channels a chance. Some of the lesser-known social media channels can be great avenues for marketing. Yahoo and Google Groups, Tumblr and forums are examples of these kinds of channels. They may require a softer approach (less hard selling or self promotion) but can help you get the word out about your product or service. Search for existing platforms for your niche and determine whether you can provide value and market subtly at the same time. 6. Listen. Create accounts on the various platforms and set up searches for keywords, your brand name and other niche terms. Invest some time listening to the conversations going on and find out where the most active and relevant discussions are taking place. 7. Get involved. Start engaging with users, posting content and building a follower base on the platforms you have chosen (three maximum to establish proper engagement – more channels than that and you’re going to have to either outsource to a social media manager or dedicate an inordinate amount of your time to keep everything straight.) Allot a significant investment of time and energy into each platform. Read about best practices on each network and follow the unspoken rules of etiquette. 8. 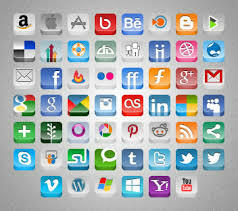 Assess the success of each platform. After about three months of consistent engagement and effort, it is possible to see where your efforts are paying off. Use the statistics the platforms provide as well as your website’s analytics software to assess whether your marketing efforts are bringing customers to your website, spreading brand awareness and positioning you as an expert in your field. For platforms which aren’t succeeding, either stop using them or change your strategy. On the other platforms, see what you are doing right and make a note to do more of it. Keep assessing periodically and continue to read up on changes and advances in each platform and on social media in general. Social media is a rapidly changing technology so it’s important to keep on top of developments. Follow these 8 steps to choose a social media platform that works for your business. Proper research is a time drain in the short-term but will ultimately save you lots of time and frustration. You will be able to focus your energies on the platforms that can really help your business and make your brand stand out online. You know that annoying person who always finishes your sentences for you? Ever noticed how Google seems more and more like that? Just start searching for “how to scramble eggs” or “madagascar hissing cockroaches” and every letter of the way you will be given a dropdown with different suggestions of what you might be searching for. You may appreciate Google’s prompt assistance, or you may find it too forward. Whatever you think of it personally, let’s take a look at how the new Google Suggest feature is impacting your business and marketing efforts – and discuss how you can take advantage of it. First, what determines what gets suggested? 1) Search volume – this is a biggie, and makes sense. The more people searching for a term, the more likely it is to be suggested in the Autocomplete. 2) Timeliness – there needs to be a distinction between big picture search volume and little picture search volume. Some topics are popular, period. iPhone. Justin Bieber. Puppies. They drive large amounts of search no matter the day, no matter the hour. Then there are topics which have seasonal high peaks. The Super Bowl. Cyber Monday. Mother’s Day gifts. And there are also topics which trend because of a news event. Hurricane Sandy. Royal baby. Malaysia plane. 3) Location – the suggestions you’ll get for “shopping” will be different if you’re in New York versus Hong Kong. You can affect what you’re shown by changing the location setting on your browser. Even if you change the location setting on your mobile browser, though, you’ll still be shown the suggestions relevant to where you really are – can’t fool those smartphones. Let’s give an example to see this in action. If you type the letter “o” into Google, you’ll get this dropdown. Why does “olympics” not appear when only “o” is typed, whereas “old navy” makes the cut? If we check out the average monthly search volume in Google’s Keyword Planner, we’ll see that “old navy” does have significantly more search than “olympics,” which could answer our questions. Old Navy has a relatively consistent number of people a month searching for it. Olympics search is anything but consistent. Why? Because people mainly search for olympics when it’s… uh, the Olympics. So it could be that a month ago, if you typed “o”, olympics would beat out old navy – or any other o term. And it could even be that we’re seeing it suggested now for “ol” because of leftover olympic fervor, and if I type in “ol” in another five months, it won’t be suggested at all. type in “black f”. What does Google suggest? But if you look at Google’s top searched terms for 2013 (an interesting read in and of itself), the top searched event is “Black Friday”. 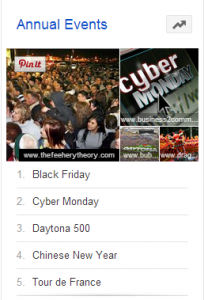 Black friday is way higher – what gives? Who’s betting that come November, Black Friday will be the top suggested term when you type in “black f”? Interestingly enough, when I typed in “black f” just now (as opposed to last night when I took that screenshot, Google suggested “black friday” as an option.) What changed? Well, I did at least a search or two for “black friday” in between in the context of writing this blog post. The artificially intelligent mind of Google learns fast. Okay, now you know how it works. What does that mean for your marketing? Get on the bandwagon. Trying to think of a topic to write a blog post about? Start typing topics and see what Google suggests. Piggybacking onto a popular current event or news item can be an effective traffic strategy. Do be aware that it may or may not be an effective business strategy, depending on whether the visitors you’re attracting are actually interested in what you have to offer. Take control of the topics Google suggests for your brand. Do a search for your brand. What brand topics does Google suggest? Jobs? Reviews? Scams? (Uh-oh.) For all the topics you’d like people to find, build out pages on your own website for them. Make sure you have a “jobs” page or a “revenue” page. If reviews show up, be proactive about pursuing good reviews on sites like Yelp. If scams, scandals or other negative terms (dis)grace your Google suggestions, it might be worth checking with an online reputation management specialist to see what can be done about it. How can you affect which terms are displayed for your name? 2) Mentions of the term on the internet. You’d like Google to suggest “our brand special offers”? Use that term on your website, across social media and on your posts on other sites. More details about popular suggest terms for small, medium and large businesses and hints for affecting search results can be found in this great post. We suggest you go take a look at Google Suggest and discover what it can suggest to improve your online marketing. Find anything interesting? Let us know in the comments below!